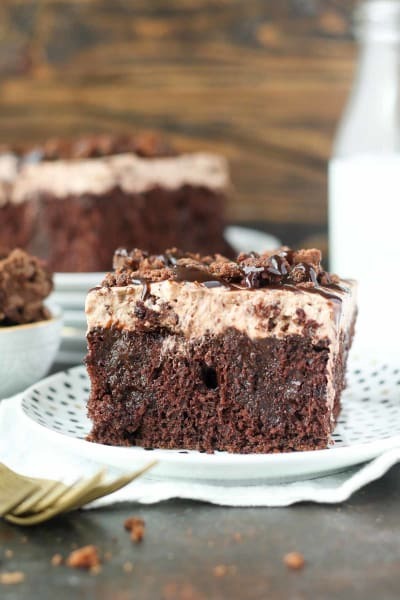 Brownie batter poke cake is a chocolate lover’s dream! 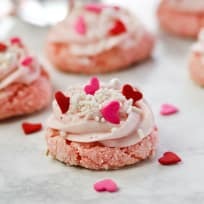 This decadent treat is easy to make, and is such a crowd pleaser. We just returned from our yearly summer vacation in Bass Lake. It’s with my fiancé’s family and they’ve been going to the lake since they were kids and for the past several years I’ve been fortunate enough to join them. There is something so peaceful about listening to the waves glide into the cove, the breeze flowing through the screened in patio and lakeside fires that makes a person just want to relax. Of course, the best thing about going on the lake trips is the food. Whatever it is, it always tastes better at the lake. 9 out of 10 meals are cooked on the grill, including breakfast, so it’s pretty much perfect. The other thing about this group of family and friends is that I can always count on them to join me for dessert. Usually it’s too hot to actually bake at the lake, and let’s be real, I can’t really bake very well at elevation. However, we always find a way to end the evening with something sweet. 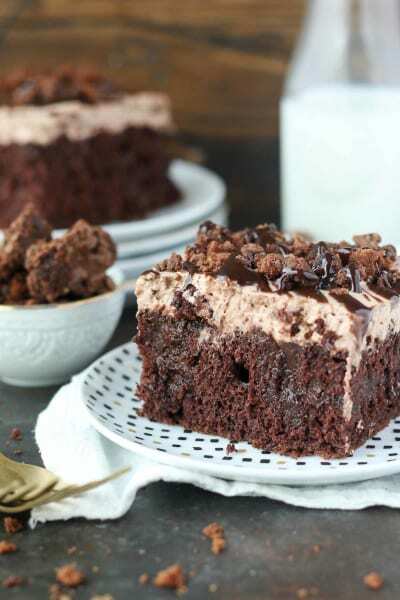 There are few things that pique someone’s interest more than a Brownie Batter Poke Cake. This is a chocolate cake, soaked in chocolate pudding with a brownie batter mousse on top. 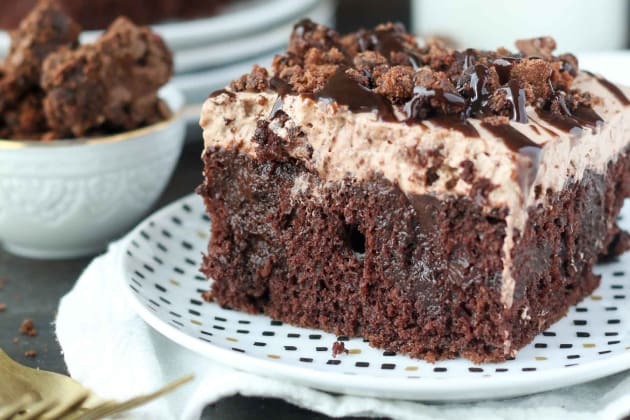 I’ve made this one a few times, and it’s a great variation of my signature Triple Chocolate Poke Cake. 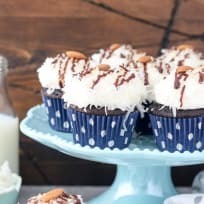 What makes this one so unique and different is that it’s covered with a Brownie Batter Mousse, which is basically a brownie batter whipped cream that’s loaded with baked brownies. 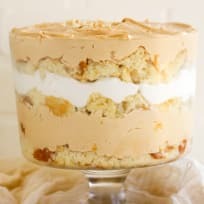 It’s one of the layers of my No-Bake Icebox Brookie Cake. It’s quite simple to make the brownie batter mousse. You’ll beat the heavy whipping cream as if you’re making a homemade whipped cream, and then you’ll add dry brownie mix to the cream. It thickens it up to a great consistency. I also like to add gelatin to the whipped cream because I think it makes the mousse more airy after it’s had a chance to set in the fridge. For the actual brownies in the mousse, I tend to use store bought brownies and chop them up nice and small, about the size of a dime. Of course, it never hurts to make a batch for brownies at home, but it does add some steps to the process. So, it’s your choice! 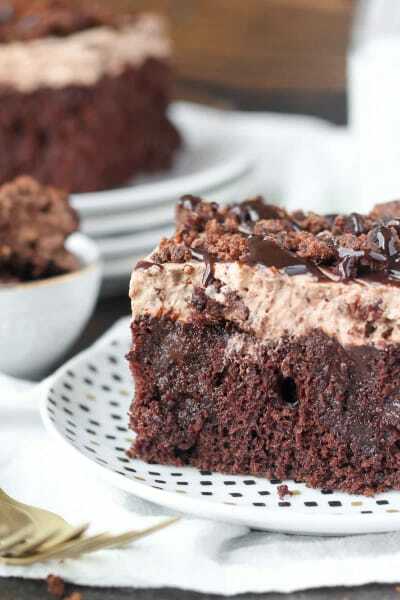 I can’t forget about glorious chocolate cake that soaked in chocolate pudding either. 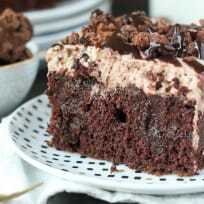 The combination of this mouthwatering cake and the mousse, it that can’t be beat. For the cake: Preheat oven to 350°F. 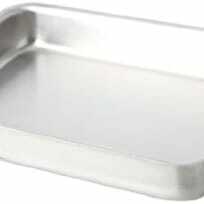 Bake cake in a 9x13-inch pan for 18-22 minutes. Check for doneness by inserting a toothpick into the middle of the cake. 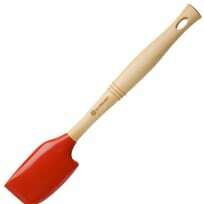 If the toothpick comes out clean, you cake is done. Allow to cool for at least 30 minutes. For the filling: In a small mixing bowl, combine the chocolate pudding and milk and whisk until the pudding mix is dissolved. 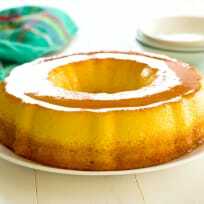 Before the pudding sets (do not refrigerate), pour it over top of the cake, and spread with a spatula to fill in all the holes. Refrigerate the cake for at least 15-30 minutes until the pudding is set and the cake is completely cooled. 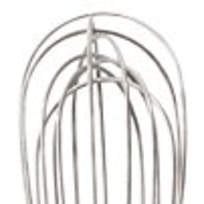 For the topping: Put the bowl and whisk attachment in the freezer for 5-10 minutes to get them really cold (this step is optional, but a common practice I use). Next, melt the solid gelatin in the microwave for 5-8 seconds until it turns back to a liquid. Watch it closely! Pour the heavy whipping cream into the chilled bowl and beat on medium speed for about 3 minutes until the cream starts to thicken. Slowly add the liquid gelatin and continue beating until soft peak form. 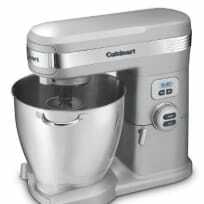 Turn the mixer down to low speed and slowly add the dry brownie mix. Once the dry mix is incorporated, turn the mixer back to a higher speed and beak until stiff peaks form. Chop the prepared brownies into small pieces, about the size of a dime or smaller and gently fold them into the brownie batter mousse. Spread the mousse over the cooled cake. This cake must be refrigerated. Garnish with hot fudge sauce and more crumbled brownie pieces. Recipe notes: For the actual brownies in the mousse, I tend to use store bought brownies and chop them up nice and small, about the size of a dime. Of course, it never hurts to make a batch for brownies at home, but it does add some steps to the process. So, it’s your choice! 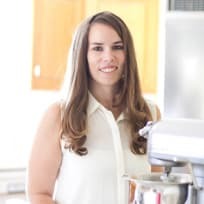 Julianne loves all things dessert, and shows it on her blog, Beyond Frosting. 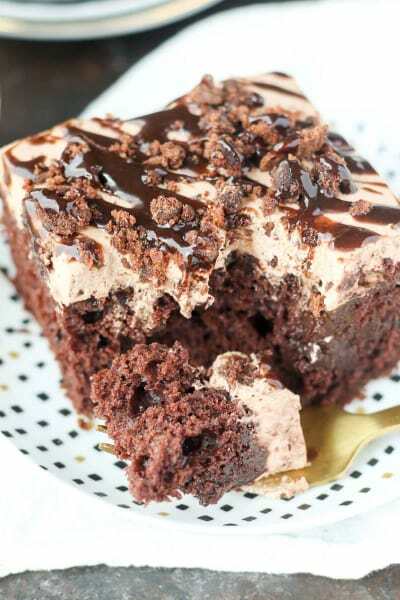 She's sharing shortcuts to create decadent desserts using cake mix as our Cake Mix Fanatic!